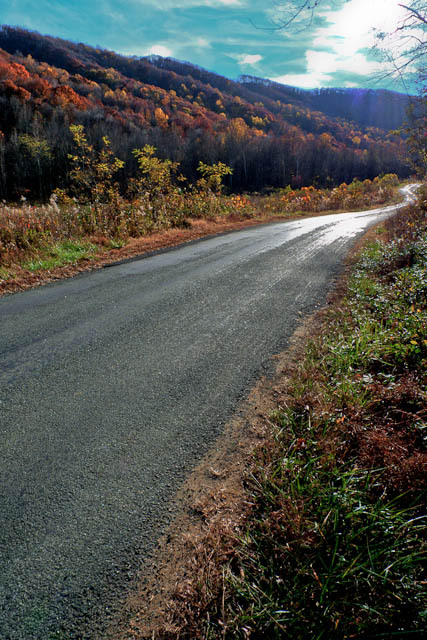 As I was driving along this winding, narrow road in a quiet Blue Ridge valley, with the sun in front of me, I liked the way it reflected off the road, and how it made the remaining fall colors sort of shine. So, I stopped and took a couple of shots. The fact I was shooting into the sun, while using my small Lumix LX3 camera, washed out a lot of the image in the upper right. But, with some messing around in post processing, I was able to bring out more of what I actually saw.